Patterns are everywhere in nature. There are patterns in leaves and flowers. There are patterns in a cat’s fur and a bird’s feathers. Some patterns are big, like the bands of a rainbow, or small, like the rings in a spider’s web. By observing patterns, children learn to identify geometric shapes and designs. Patterns help children grasp basic mathematic principles. But looking for patterns in nature is also great fun and develops an appreciation of the world’s natural beauty. Steve Swinburne’s lively full-color photographs show children a wide range of nature’s exquisite designs. He invites children to open their eyes and look for patterns in water and on land, in the air and on the ground, and in their own neighborhood. They will see the world like they have never seen it before. “Where do you get your ideas for books?” I’m often asked this when I visit schools and talk to children about writing and photographing books. One of the best ways I’ve found to dream up ideas for books is to go for a walk. One sunny June morning I was walking around my garden in Vermont when an amazing sight stopped me short. I saw this dew-spangled spider web sparkling in the morning sun and noticed the beautiful spiral pattern that was formed. I ran inside to get my camera. I was hooked. 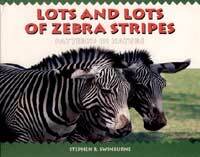 I looked everywhere for patterns and the idea for LOTS AND LOTS OF ZEBRA STRIPES was born. Become pattern artists! Bring crayons, markers, and paper outside and draw the patterns in nature you find. Look for man-made patterns, too. Can you see more man-made or natural patterns?